A few weeks ago, I wrote about auxin. And how auxin signaling works. As promised in my last post, I’m going to tell the story of identifying the auxin receptor and a recent development in the story. The most common auxin plants use, Indole 3-acetic acid (IAA). 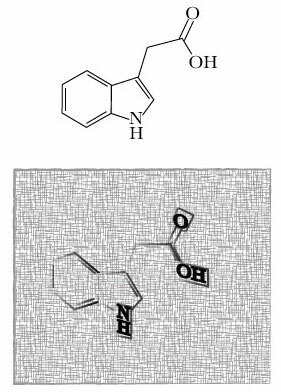 Top: The molecule. Bottom: my creative rendering of auxin. Ascribing a function to genes (a single unit of the multi-gene/genome DNA blueprint of an organism) is difficult. And in a way it’s not the most meaningful question. Knowing the protein encoded by a gene is only part of the story. On it’s own, that does not tell you anything about what the gene does at a biochemical level. In the modern era of sequenced genomes and protein databases, searching a sequence can give some clues about what a protein does and possibly it’s activity within a cell. This assumes other investigators have studied similar proteins. Knowing the biochemistry does not necessarily give a sense of what a protein does in the context of the whole organism. In other words, when the protein carries out its activity, what effect does that have on the cell it’s in and the organism? Few genes have dramatic effects, so it’s also a question of what processes and responses a gene might contribute to. As a reminder, most of what we see in an organism is the result of proteins. There are sugars, lipids, nucleic acids, and a few other trace things too, but proteins are responsible for most of the active processes of life. Knowing the biochemistry does not necessarily give a sense of what a protein does in the context of the whole organism. In other words, when the protein carries out its activity, what effect does that have on the cell it’s in and the organism? In my last post, I noted that scientists have identified all the receptors for hormones (at least the major plant hormones). Just because a receptor protein has been identified, does not mean that it is the only receptor for a hormone encoded in the genome. There could be others that operate via different mechanisms. The classic idea of a receptor is that a ligand, the science term for the molecule that binds a receptor, would float in from outside the cell. It would bind and activate the receptor to do something. Receptors can also exist in membranes within cells (that is the case for cytokinin and ethylene receptors). The auxin receptor is free floating within the cell. The basic thing a receptor has to do is bind a ligand that can tell it to start doing something. Like a key in a lock to open a door. Another fact to know in biology: genes have 3 or 4 letter designations most of the time. These are often acronyms denoting the discovery process of the gene. Sometimes they get funny names because scientists like to have fun sometimes (Scientists working on fruit flies are the royalty of funny names for genes). Genes are also assigned number designations based on genome sequencing projects. Each gene has a number that also notes something about its location. In Arabidopsis, the form this takes it At4g31040. At = Arabidopsis thaliana, the 4 designates the chromosome, and the number is the location on that chromosome. Last, in plants and other organisms, genes often occur in families. There are many similar genes based on their sequence. Mutant screens and genetic mapping had identified several genes involved in auxin signaling. In 2004, scientists knew that a protein called TIR1 (Transport inhibitor Response 1) triggered the degradation of a set of proteins called Aux/IAAs. Once degraded, the Aux/IAA proteins released a protein they bind to called ARFs (Auxin Response Factors). ARFs go on to regulate genes, turning them on/off and thus affecting a cell’s characteristics. And all of this required the presence of auxin. The question was just how auxin trigged TIR1 to degrade an AUX/IAA protein, thus releasing an ARF. One idea was that auxin triggered a modification of TIR1 in some way and thus activating degradation activity. Perhaps auxin enabled TIR1 to become part of the degradation machinery it’s a part of. I won’t get into it much, but TIR1 is an ‘F-box’ protein that has to be bound to a few other proteins to be able to degrade a target protein. The F-box is the part of the complex that provides specificity of target degradation. There was precedent for the former possibility. Modification of proteins like TIR1 in other systems required a modification before they could degrade a target. The auxin signaling pathway. Left: Without auxin, Aux/IAA proteins physically bind to ARFs, preventing them from acting. Right: When auxin is present, it forms a co-receptor complex with TIR1 and the Aux/IAA that is targeted for degradation. The ARF is then released to go do what ARFs do. Two research groups published in the same issue of Nature in 2005 the fact that TIR1 didn’t need modification1,2. Auxin bound to TIR1 and this promoted interaction with Aux/IAA proteins triggering degradation of the Aux/IAAs. This has developed into the idea that TIR1, auxin, and AUX/IAAs are a co-receptor complex. All three are needed to trigger an auxin response. This mechanism was novel. A small molecule acting as a bridge between degrader and degron (a great word) for activity. Further work has shown other plant hormones jasamonic acid and gibberellin operate through a similar mechanisms. The insight into how auxin perception required years of research beforehand. In fact, it required knowing everything except exactly what auxin did to trigger the pathway. The biochemical experiments to show that TIR1 was a key part of the auxin receptor turned out to be more straight forward than perhaps anticipated. They were thinking they’d find other proteins involved in activating TIR1 that also bound auxin. It turned out that TIR1 and a target was all that was needed to get auxin to bind to an AUX/IAA protein. This receptor discovery was huge. Figure 1a from Kepinski & Leyser, 2005. The degradation domain of an Aux/IAA was used to pull TIR1 out of a protein solution with or without auxin. As you can see, auxin (IAA especially) is needed to be able to get TIR1 out of solution. However, TIR1 was not the first protein found that was able to bind auxin. A protein named ABP1 (Auxin Binding Protein 1) was first. It’s a single copy gene in Arabidopsis and was initially found in corn. It does bind auxin. And it has been studied a lot. It does not seem to be involved in the auxin signaling pathway outlined above. In genetics, the gold-standard is to have a true loss-of-function mutation to gain insight into what a gene does. Losing function ideally means the protein is no longer made. The gene is in essence, broken. There are many ways to achieve this. Inducing an early stop for when the DNA gets turned into messenger RNA and translated into protein…an early stop means most of the protein is not translated. Insertions or deletions of the genomic DNA can cause disruption of the normal gene sequence getting transcribed. These different versions of genes are known as alleles. And in biology, mutant versions of genes are usually written in lower case. An abp1 insertion allele was shown to be lethal. Other alleles that made the whole protein, but unable to bind auxin were identified. Though this only eliminated auxin binding, not anything else the protein might do. Scientists also used a reverse copy of the gene to partially silence it. Another technique to study genes is to over-express the gene. Both of these have to be interpreted cautiously because because of off target effects. By altering expression, you’re removing a lot of context from a gene’s normal expression pattern. And you’re introducing something into the genome that may disrupt things as well. Last month, a paper entitled “Auxin binding protein 1 (ABP1) is not required for either auxin signaling or Arabidopsis development” was in PNAS3. This is a strong title in academia and refutes a lot of previous reports. It is also unusual because it reports only negative results. Results where no difference was seen between a control and an experimental manipulation. Losing ABP1 function does not appear to affect the plant under normal lab growth conditions. What they did in this paper was generate a new, true loss-of-function allele of ABP1 using a new genome editing technology, CRISPR. Their allele does not make ABP1 protein. They also found a second allele from an insertion database and found the same results as with their CRIPSR allele (another gold standard in genetics, having multiple alleles). Losing ABP1 function does not appear to affect the plant under normal lab growth conditions. This opens the question of just what ABP1 does. There may be contexts where it’s important, but this new paper suggests that it is not an essential gene as suggested before. It may be part of an environmental response system (to internal or external cues). It’s also possible that it’s a vestigial protein, something that once had a function but whose role has been lost. It is an auxin binding protein. But is it a receptor too? Does this discount ABP1 as a second auxin receptor? These are questions that will have to be addressed in future studies. It does not seem likely that ABP1 does nothing and now scientists have a new tool to figure out just what that is. The authors do make a strong case for a lack of a role for ABP1 in normal, lab growth conditions (which do tend to be better than out in nature). It is impossible to be exhaustive in any one study. They did not compare it with partial loss-of-function alleles directly. And they didn’t test rapid auxin responses (those not requiring changes in gene expression) that ABP1 has been implicated in in previous studies. Still, this report makes a strong case for interpreting partial loss-of-function alleles with care. 1. Kepinski S, Leyser O. 2005.The Arabidopsis F-box protein TIR1 is an auxin receptor. Nature. 435:446. 3. Gao Y, Zhang Y, Zhang D, Dai X, Estelle M, Zhao Y. 2015. Auxin binding protein 1 (ABP1) is not required for either auxin signaling or Arabidopsis development. PNAS 112:2275. My greatest moment in plant science.